Height 13 cm (5 inches). Diameter 10 cm (4 inches). 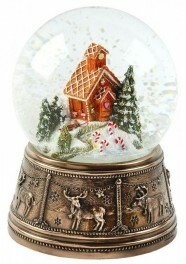 A beautiful snowglobe from the Bronze Fine Arts range. Made from cold cast bronze and hand finished to perfection. Beautifully detailed interior within the glass ball. Also finely detailed around the bronze stand featuring stags. Part of the Genesis Bronze Art range: producing high quality giftware for over 20 years now. 5 inches tall (12.5 cm tall).